In medium bowl, stir cookie mix, egg, oil, water, vanilla and 3 ounces softened cream cheese until soft dough forms. Stir in the white chocolate chips and milk chocolate chips (not the semi-sweet chocolate chips). Drop the dough by rounded tablespoonfuls onto an ungreased cookie sheet. Bake 8-10 minutes or until the cookies are just set. Cool a minute or two on the baking sheet and then move to a cooling rack to cool completely. Meanwhile, melt the semi-sweet chocolate in the microwave on full power, stirring every 30 seconds until melted and smooth (normally about 1 minute). Stir in the remaining ounce of softened cream cheese and heavy cream until melted and smooth. If needed, warm the chocolate in the microwave to help melt the cream cheese into the chocolate. Stir until smooth. 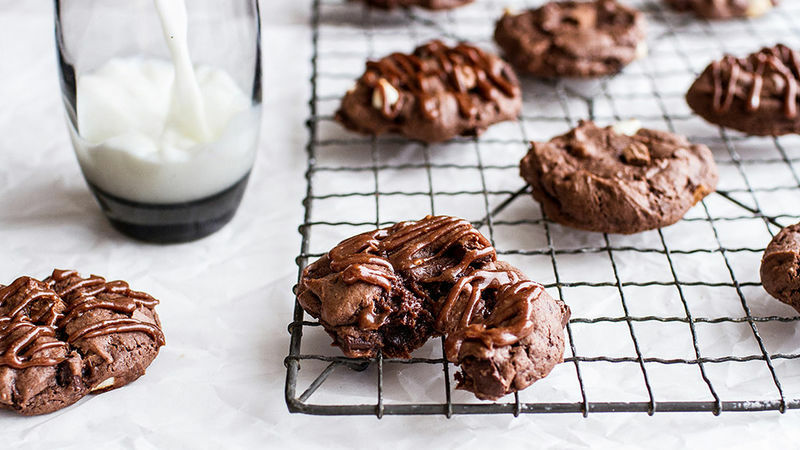 Drizzle the warm chocolate over the cookies. Serve or store in an airtight container for up to 4 days. For a festive take on these cookies try sprinkling them with flakey sea salt or swap the milk chocolate chips for holiday M&M™ candies. You can freeze these cookies, minus the chocolate glaze, tightly wrapped for up to 2 months. Dethaw on the counter and then prepare the glaze as directed.